This is what I have ordered. LiterMeter set up as Scott at SpectraPure advises for auto top off and water exchange. This is what I am undecided about: Siporax in tower or canister bio-filter at high rate ? 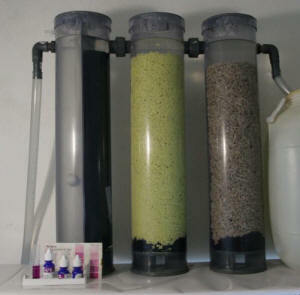 "The setup is pretty simple: The first step is mechanical filtration, e.g. sera biopur (clay tubes) or sera biofibres. The amount depends on the waste amount, practical values range from 0.5 liters - 1 liter. The main step is biological filtration with sera Siporax, and in this case I recommend about 4 liters plus a relatively slow flow rate (200 - 400 liters per hour). After a few weeks (activation period) this will take nitrate values down considerably. There is, however, another way: A separate slow flux filter in addition to the normal biofilter. This filter (a passive bypass system is OK) should then hold 2 liters sera Siporax, with a water flow rate of only 1 - 2 liters (no typing error!) per hour. This setup will produce virtually nitrate-free water." There you have it. So its similar in function to the deeper layer of DSB..
My thinking on it was that a Siporax system like this is accessible, simple to remove, and easy to maintain. The product was born and died and has now been revived, so always looking for lost causes I would give it a try if I could set it up right. Guess 2 #3's are better than? any info on aquaripure.. does it work in saltwater tank? It's a filter that removes nitrates(injecting 7ml of vodka) running water through tube removing oxygen. Made by Aquaripure. This likely will not occur for a couple of months. Do inquire at that time as we do not store/save queriors email addys. I have an Aqua Medic NR1000 which was working fine until I had to take it out of action recently due to a faulty dosing pump, then a leak. The reactor was out of action for about 2 weeks. I fixed it last week and set it running again, I got the usual rotten eggs smell but was not too concerned as this had happened before when I had it out of action for about 2 weeks, and it normally cleared after a couple of hours without any problem. I put the outlet into my tank and waited for the smell to clear (as before). The lights were off so most of my fish were still in their hiding places. I then noticed that my fuzzy dwarf was not looking to clever. I removed the reactor outlet from the tank and let the output flow into a bucket (the inlet was still being fed from the tank) and run the reactor constantly for 2 days, continually testing the water in the bucket. The readings from the bucket are PH 8.0, Ammonia 0.5, Nitrate 0, Nitrite 0 The readings from the tanks are now PH 8.2, Ammonia 0, Nitrate 0, Nitrite 0 I want to start using the NR1000 again and have spoken to Aqua Medic about the ammonia, they have suggested that I clean out the reactor and start again. I will if I have to but this takes about 2 weeks to cycle which is really difficult and worrying when I have water being pumped out of my tank whilst I am at work (day) or sleeping (night). I don't have an auto top-up. I am using Deniballs (which are fed with Denimar powder until ready) and Bactoballs. My question is, do I really need to clean out the reactor and start again, or can I use something like AmmoLock or Amquel + to make the ammonia safe, or will there be some sort of reaction with the bacteria in the reactor. and it will still be read on a testing kit. How long will this continue for as I will have no way of knowing whether the reading I am getting is safe. Bob, thanks for your help, I will start again. Sorry Bob, can't resist tapping into you knowledge. The nitrate reactor is now up and running again with 0 nitrates, ammonia and nitrate being recorded from the outlet. It does however strip out the Ph. I have placed the outlet into the skimmer compartment which buffers it a bit (between 7.8 and 8.0) Please can you advise what you would recommend to buffer the Ph back to normal levels. <I wouldn't worry re... in time (a few days to weeks), most all the "easily reduced NO3" will be gone and the pH shouldn't be so drastically affected. When I got up 3 days ago no fish was <were> swimming (I had 6 fish). Two angels have died all the rest was laying on the sand heavily breathing. The problem was lack of flow through the nitrate reactor for a few days resulting in rotting. I don't know how and why flow suddenly restored itself and pumped ammonia to the tank overnight. Anyway, I've disconnected nitrate filter, changed media in canister filter, done two water changes, added ammonia binding chemicals and managed to improve water quality to the level which wouldn't harm healthy fish. Three fish (snowflake eel, dogface, filefish) ,although still looking depressed , started to swim. Except valentini puffer. He can move if he chooses to but in an uncoordinated fashion. For the last two days he has been holding upright position (on his tail) supported on the rock. Breathing seems to be very fast and shallow. I am concerned as he has no appetite so will be getting weaker. I was wondering what your thoughts are on the bio pellet craze. One in particular, Warner Marine Ecobak. I am in the process of setting up a coil/sulfur denitrator and am having a slight problem. Even at a slow drip of 1 drop per 3 seconds, I get almost 1ppm of nitrite. Is it safe to assume that the anaerobic colony is insufficient and only stripping off one of the two oxygen molecules from the nitrate? If so, would it be okay to allow the system to go to a complete stop allowing the reaction to go completely to the right. I know hydrogen sulfide may form, but the bacteria colony would increase, wouldn't it? Once I smell the rotten eggs, I could start introducing fresh nitrates and expose the effluent to my Sander Ozonizer to oxidize the hydrogen sulfide. Another alternative would be to run the denitrator on an empty QT and feed the colony some skimmate. Any golden nuggets of wisdom you could throw my way would be greatly appreciated. <It will take some time for anoxic conditions to be established within the denitrator so do be patient. It is possible to speed up this process by the addition of a carbon source to the water. This carbon source will be processed by bacteria with3in the unit, using oxygen up and generating the low oxygen levels needed for proper operation. This can be done by adding about 25 milliliters of vodka (please do not use Absolut Vodka, is a waste of good vodka) or a sugar solution to the denitrator column. Let the circulation pump run a day or so making sure no new water enters the column. This process should lower the ORP to a usable level in that time frame. Then, start with a very low flow rate and check daily for any hint of hydrogen sulphide. If it is detected, the denitrator will require more oxygen and a small increase in flow rate will be needed. This is the "fine tuning" period, and may take quite some time to tune in properly. If, after 4 to 5 weeks of operation, and no nitrate reduction occurs, you will need to reduce the flow rate a very small amount, and this may have to be repeated if after 2 to 3 weeks, no nitrate reduction is noted. This is the negative side of sulphur nitrate reactors, time consuming to properly set up and is the main reason I have never incorporated one in my system. Once the sulphur denitrator is tuned and running, keep an eye on alkalinity and pH. Alkalinity will be used up faster than without the denitrator in operation, so an increase of alkalinity buffers may be needed. A RedOx meter that can read negative values is a very useful tool for fine tuning denitrators. The ideal ORP range would be between -100 to -250 with -170 being optimum. Above -50 indicates too much oxygen for the denitrator to function properly, and below -300 indicates the water has reached anaerobic conditions, at which point hydrogen sulphide will be produced. I am finally getting zero nitrites and nitrates out of the denitrator. It appears my combining a rather long coil (7 meters of 6mm ID airline) was overly effective at removing the O2. This plus the double reaction chambers meant almost 10 meters of travel, so it went anaerobic. Speeding up the effluent with a small colony meant nitrite. I sped up the drip and allowed nitrite to escape into an ozone reaction chamber returning any nitrite back to nitrate. The increased flow appears to have allowed the colony to multiply as I can now process a gallon an hour with zero nitrates or nitrites. I guess patience was the key. Hopefully I can now keep my nitrates low enough to keep my corals happy. I thank you for your advice. <You're welcome, and thank you for the follow up. I downloaded a pic I found on WWM, taken in 08, Red Sea. Was the pic with the adult Emp. Angel amongst coral encrusted rock. What a beautiful pic, crystal clear. Nice job. On another note, can you check out my response to the denitrator query? No one took it so I thought I would take a stab at it. Thanks very much for your prompt answer. Normally I use deionized or distilled water to make Kalkwasser water. But I recently noticed that the deionized water contains 10 ppm of Nitrate. I would like to know if I can use seawater, with around 0 ppm, to make the Kalkwasser water? I just made a coil denitrator and would like to know the output flow rate per hour of the water.